Here are the Fall Cards we did for the October Stamp-a-Stack. I tried to make cards with images and colors for the fall, but I see there's one "stray" in the bunch. We used some different products this time. 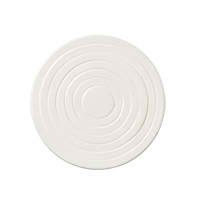 Sometimes I find my self stuck in a rut and just using the same product time and again. I've been trying to stretch myself lately and use different products, so I wanted to give my stampers a chance to play with other products too. Most recently I've been playing with the Treat Cups. If you've been following this blog then you may be aware of seeing several other posts about the Treat Cups. There are 2 shapes available: round and heart. 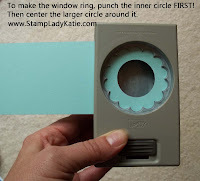 They match a 1-3/4" circle punch and Stampin'UP! 's Full Heart Punch. We used the Round Treat Cup on the Sunflower Card. 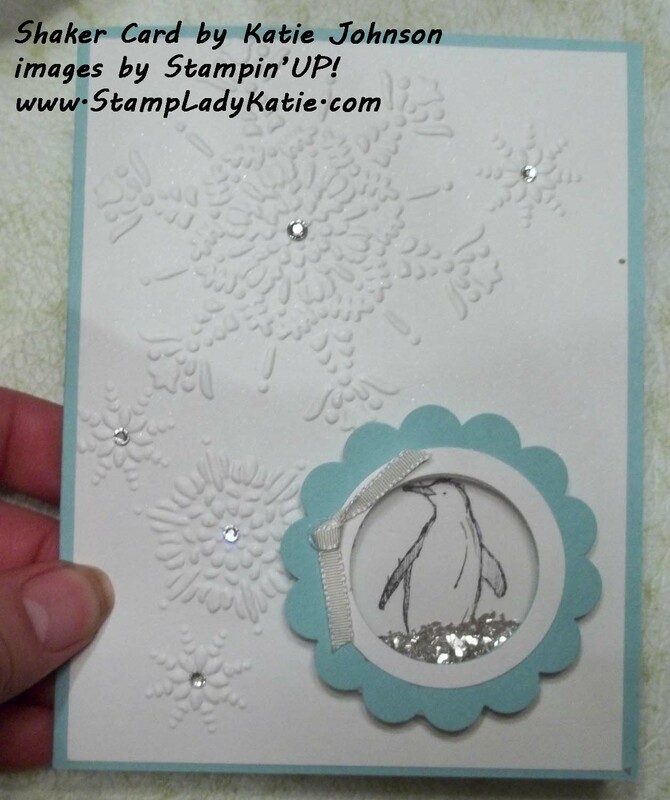 (upper left in the photo) The card we did at the Stamp-a-Stack is very similar to this card I made for a trade. 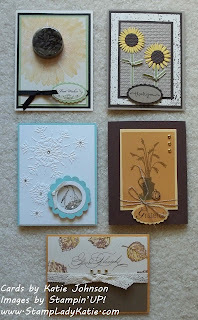 I also used the sunflower on this card posted with the sunflowers from my daughter's wedding. 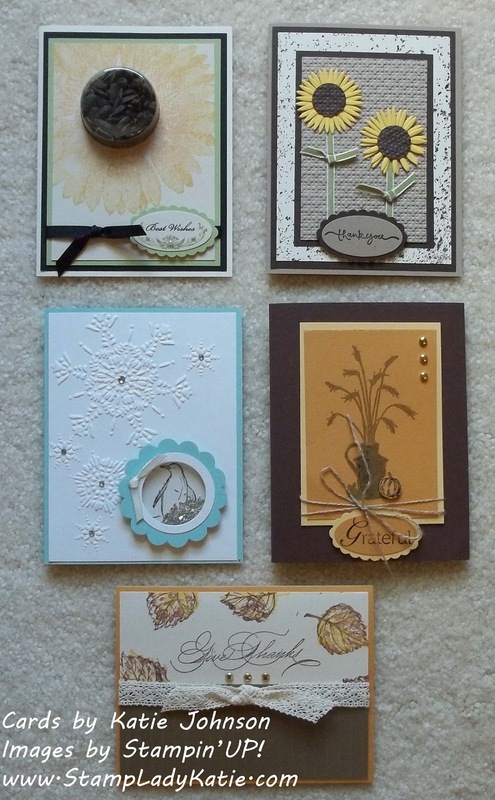 Two other new products we used are Stampin'UP! 's new Glitter Glass and the new Shaker Frames. The Shaker Frames come as 6 sets of 6 different sized foam adhesive rings. That's 36 different rings total. We used them to make the penguin shaker card. This card sparkles for several reasons: The Glitter Glass in the shaker window, the Self-Stick Rhinestones on the snowflakes and the paper itself is Shimmery White paper. The card itself is easy to make. Add the "LID" to the ring to keep the glitter in. Add a few Self-Adhesive Rhinestones and voila! Making the lid involves several layers. The bottom layer, closest to the foam ring, is a 2" acetate circle to keep the glitter contained. The next layer must have a hole so you can see the image. For the scallop we used the 1-3/8" circle punch for the actual window and the 2-3/8" Scallop Circle punch around it. I added a top ring to frame the window using the 1-3/8" circle punch for the hole in the middle and the 1-3/4" circle punch for the ring. CAUTION: punch the inner hole (ie the window hole) first and then center the larger punch around the hole. Would you like to make a Window Card? Get all the supplies to make this card HERE . I appreciate your business and am ALWAYS willing to answer your questions about how to make projects. wait a minute: Can it get any better? Yes it can! Buying that Starter Kit means you've "joined the Stampin'UP! family" and you automatically get an additional 20% off your purchases. Great! Can it get any better? Yes it Can! Once you "join" you have access to a company sponsored support website. This website has all kinds of ideas for both business minded demos and for hobbyists. There is also a monthly magazine. And you can attend national and regional stamping events. Amazing, can it get any better? Yes it can! Your first qualifying purchase after buying the Starter Kit is actually a 30% discount. Wow, can it get any better? Yes it Can! If you join with me you also get access to an exclusive website that I maintain for my downline. It has additional images of card ideas and business ideas. Including ideas for how to start your own clubs and classes for your friends and neighbors and how to meet new customers. This is a wonderful perk for people in my downline and a perfect way for me to support people who are not local to my area of Wisconsin. By joining me you will also be joining a larger group of locally active demonstrators and have access to our monthly and quarterly meetings. For people who are not local, my website allows you to benefit from all the business and project information that comes from being part of our group. For the hobbyist: It is an excellent way to build your skills and knowledge about the craft. Rest assured, there is no obligation to run a business or to become an active demonstrator.. . .You are just getting a whole lot of product (granted in one lump sum) for a really amazing price. You can also be confident that when and if you're ready for it, the business support is there too. And for me, this has been a really, really fun way to start a business. More coming soon with details on other individual cards.